You can say this about William Bruce: he's not afraid of change or embracing new challenges. He's proven both since we profiled him in 2012 and named him our MVP Noble Cause Award winner in 2013. In early 2014, he left Abundant Brands, where he had spent a half-dozen years, and as COO was overseeing more than 250 Subway locations and more than a dozen Costa Vida Mexican Grill restaurants, as well as three other brands. "I felt like rather than just maintaining what the company had, that I'd like to really get back to a more active building and developing approach," he says. That's when serendipity struck. His name had been floated to some executives with a Dallas-based commercial real estate company, Encore Enterprises. The $2 billion company had a restaurant arm, Encore Restaurants, and approached Bruce about doing some consulting for them. "In the spring of 2014 they came to me and said, 'We have one IHOP in Mississippi and want to know if we could expand that brand and maybe others.'" Bruce says. "I went down to check it out and I told them I thought it was doable." He also discovered an opportunity to get Encore into Five Guys Burgers and Fries. 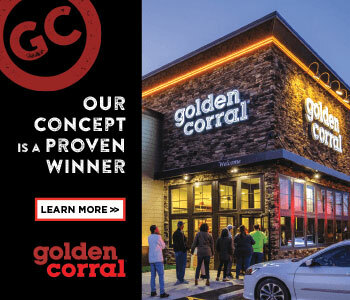 In May 2014 Encore hired him as president of its restaurant development division. The deals have been fast and furious ever since. The first order of business was the buyout of eight Five Guys franchised locations in California from a group that had held that territory for four years. Bruce proved he still had a knack for turning things around: in 45 days, profitability at those units increased 8 percent and has remained there. There are 45 more Five Guys units in the works, with 5 already in development and 21 additional sites under negotiation. "We plan to open 12 to 15 Five Guys per year," he says. IHOP growth also remains on his radar. Encore has two IHOPs open in Mississippi and two more under development. With franchise locations and territories spread from California to Mississippi, Bruce, who lives in Salt Lake City, says he is doing a lot more traveling these days. The timing is favorable: with all but one of his children now grown and out of the house, he and his wife Tali have a much more flexible schedule than just a few years ago. "Encore Enterprises is based in Dallas and I find myself in the offices there quite a bit, too," he says. "But it all works." Almost a year into his new position, Bruce is pleased with his move and believes he was in the right place at the right time when Encore came calling. 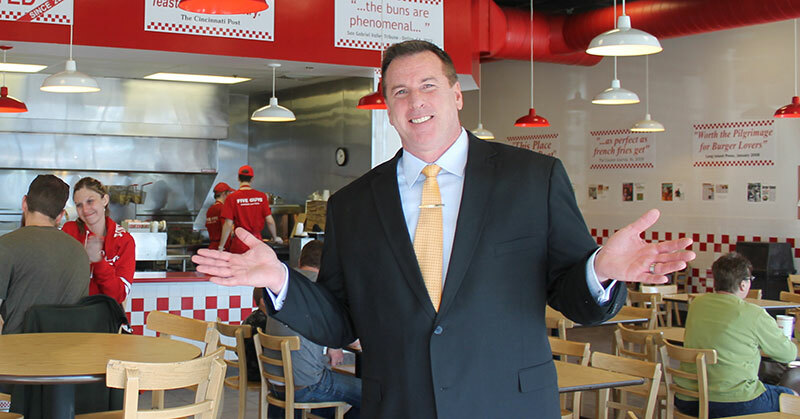 "I see nothing but substantial growth ahead for us with buying existing and building new Five Guys locations," he says. As some readers may recall, Bruce had a well-earned reputation for "doing good" with his Utah restaurants, developing a unique program at Abundant Brands to use leftover food to feed the area's needy and hungry--hot, open-faced sandwiches from Subway and seven-layer burritos from Costa Vida Mexican Grill. He says Abundant has continued carrying on the tradition he began, and he hopes to have a similar program at some of his Five Guys locations in California very soon. Some things don't need to be changed, and doing good is just one of the things that will always characterize William Ray Bruce. Family: Beautiful wife Tali, and 5 children: Kelby, 21, at Utah State, on scholarship in physics; Austin, 21, a Mormon missionary in South Korea; Kenzie, 19, at Utah State, pre-med; Baron, 19, at Weber State on football scholarship; Kaisen, 15, at an early college high school. Captain Lou's Italian Galley on the beach, slicing onions with swim goggles on so my eyes wouldn't tear. This was my job before making all those beach pizzas. Vern O. Curtis, 1981 Denny's CEO, lived in my Huntington Beach, Calif., neighborhood and had great stories about restaurants. Cami Adamson of Subway, Utah, who was able to balance high-need kids, family, and Facebook every day, while managing the many aspects of an area manager. These folks, and many like them, have influenced me over the years. Operating multiple brands, building/designing central kitchens and production models; feeding the homeless weekly with restaurant leftovers in the local communities; and getting new knees and hips and popping right back. Health has its benefits. Rapidly building the Five Guys brand in California with financial modeling for each location and analyzing locations for success. While meeting with R. Gregory Keller, president of Souplantation/Sweet Tomatoes during a personal life challenge, he said, "Pick up the pieces or your career will suffer." I picked them up that day. I supported a subordinate when I believed he did the right thing. I was let go from that position for not terminating the subordinate. To this day, I still believe that decision was the right one. My leadership grew through standing for someone else. I was young and left a job for greener pastures. I found out there are weeds in every pasture. I learned to see the long-term harvest. Today it is up-front work that will pay off in operational dividends later. Exercise/workout: I simply lift weights--building muscle to reap the rewards of eating good restaurant food. My wife sent me a Tony Robbins CD back in the dating days when I was living in another state. Tony said, "To magnify the human experience you need partnership." We were married shortly after. It has made my life, including business life, better. Motivating others to reach higher in restaurants. I cannot get enough of this. Balance is more challenging today with older kids and a great vocation. My planner schedules good plans. I execute my plans. I have no guilt for this: I love alone time with my wife; and enjoying cheesy movies and Papa John's at home. Guinness World Records. Each year I am more amazed at what humankind can achieve. Humidity. If I am going to be wet, I'd rather be in water. A surfer. I am still surfing. Snowbird. Snowboarding and spa. Magical. Oprah. She would have a potpourri of answers to various life, business, and cultural questions. Motivate. However, if the dishes need washing, throw a trash bag over your head, pop out your arms, and start washing. Example goes a long way. I try my hardest to be open to all possibilities, not just my own. Options are always better than my answers alone in tough moments. Encore has given me many avenues to expand. I want to successfully expand my company's horizon in restaurants. Ask questions. What is a better way of doing this? I believe leaders and subordinates innovate by listening to each other and making better collaborative decisions. I always have my hands, toes, and self in operations. Having folks who can perform amazingly keeps me tutored daily. Being their word and standing by their commitments. If you want my company to deliver results, then please deliver on your commitments. I feel franchisees really try to deliver on QSC in restaurants to deliver a profit. At the franchisor level, you are trying to deliver on your word. We feel really comfortable when franchisors deliver. You hunger to grow their brand. I have always believed it is communication. If they know there is a production problem, open up the lines of communication and find a solution. This is a moving target. Technology really develops new ideas and ways to announce new messages in our recovering economy. It takes talented people to see underlying tactics to bring in new and repeat guests with fewer spending dollars. Positively. Doesn't it feel great to know everyone can speak their experience good or bad? I do not dwell on the bad; we improve it. When we know something works, we tweak it and make it better. Feedback is the ultimate for getting a healthier business. I believe this is a vibration we live. We hire people who are like us in our company culture. I feel people fire themselves by not producing results, not changing, not following policies. They vibrate out. This is the most valuable tool. When we place so much attention on interviewing and finding the right people, training them to succeed is paramount. I feel that when people have the right tools in their belt, they stay in their positions until they get promoted. They are happy when they know how to do their job. Swiftly. However, I think an employee knows when it is time to go. Please vibrate yourself to a new vocation if you're not happy. Build 15 more locations and double revenue. Crew and guest satisfaction. The guest is important, but our team is central to our company triumphs. Grow both of these parties and we are in the green. Culture being lived, revenue, and profitability. Associate crew members today are running the company tomorrow. At the head of my presidential class running multiple brands. Developing my replacement to run things better. Homes have been on the upward trend. More people are eating fast casual than ever before, and they're spending more. Thank you, America. I always use historical data from our units, but technology and upcoming data companies have helped. Data companies track Visa and MasterCard, guest spending habits, what ZIP Code they are coming from, and they predict sales at various restaurants and retail centers. Technology is moving fast and the information is there for study. Encore uses EB-5. We also use high net worth individuals as a key for growth. We have 18 offices nationwide raising money through the government EB-5 program. This capital tool is a great instrument in our arsenal. Raising money and building in TEA markets, and helping the economy grow is significant to our model. President Clinton instituted this program, and over the past few years it has really been refined. Encore uses this to help our development while building and guaranteeing jobs for Americans in the marketplace. Experience with private equity, local banks, national banks, other institutions? Encore has masterminds at the helm. These financial wizards are always establishing ways for banks and institutions to invest in our evolution. Since Encore has been established, we rally in the fact that all investors have experienced increases. This speaks for itself. As a collective management team, Encore uses every possible research and technology tool as support. Finding the right relationship with internal team, vendors, and other groups helps in finding answers to costs. At our last Christmas party, Dr. Sangani and Patrick Barber recognized top performers and others for their commitment to our company culture and for exceeding goals. Understandably, this filters down to all sectors in our company: restaurants, multi-family, commercial, and the other departments. This culture of excellence and rewarding top people in the organization makes for healthy competition and distinction. Before the meeting started, our hospitality president was worried his sector did not win by a few dollars. That worry is good; it transitions into an environment of winning. We are not attached, meaning an exit strategy is important. I was coached not to get attached to investments. Why? If the right time comes to sell, and the right buyer comes in to purchase, then sell your business at a high return. The financial rewards can be larger if you understand that profits can be made. This does not mean sell and be done. It means to me, take these dollars and find another franchise who may be in trouble, turn it around, and start the process over again. Possibilities and options are thoughts for progression. I believe it is in our human nature to progress.